Boundaries: La Cienega to Fairfax, Wilshire to Third. Boundaries: Wilshire to Rosewood, La Cienega to La Brea, excluding Park La Brea. Boundary: Olympic to Wilshire, Highland to Muirfield. Boundaries: Wilshire to Olympic between Fairfax and La Cienega. Boundary: LaBrea to Citrus, Beverly to Third. Boundary: Boundaries: Wilshire to Melrose, Highland to Rossmore. Boundaries: Wilshire to Third, Sycamore to Citrus. Boundary: Beverly to Melrose, Arden to Wilton. Boundary: Garden and tower apartments. 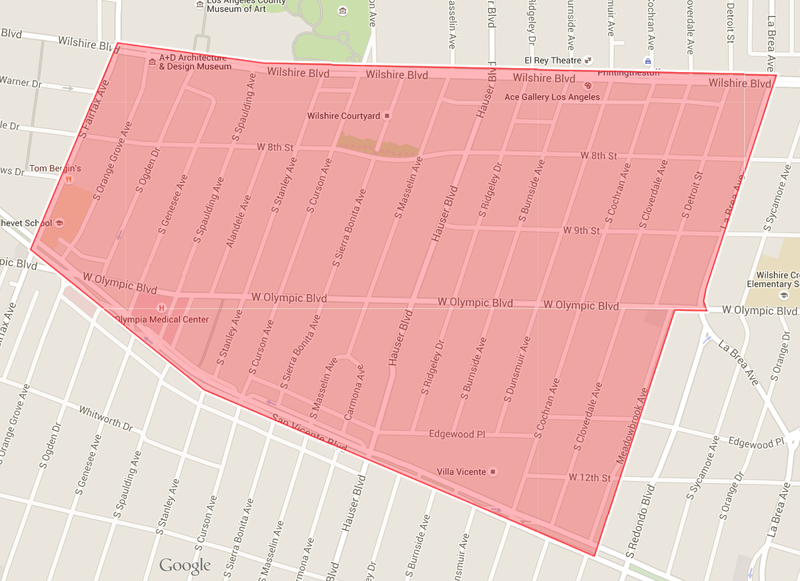 Boundary: Third to Beverly, Ridgewood, Wilton Pl., Wilton Dr.
Boundary: Third to Beverly, Gramercy to Manhattan. Boundary: Wilshire to Olympic, La Brea to Citrus. Boundary: Wilshire to Beverly, Arden to Van Ness. Boundary: Wilshire to Olympic, Lucerne to Lorraine and Victoria.